The Swiss Air Force ordered fighter airplanes Messerschmitt Bf 109 E in Germany in 1938, these airplanes came without a wireless station installed. Also the fighter aircraft Morane D 3800 produced under French licence by Federal Construction Works, Thun, from 1939 needed to be equipped with a suitable wireless station. After a thorough evaluation between a crystal controlled set from British ITT and a continously tuneable shortwave set from SFR (Société Française Radio - Electrique), the latter has been ordered: 189 wireless stations SFR 450 have been ordered in october 1939. The evaluation of different aircraft wireless stations for the fighter airplanes Messerschmitt Bf 109 E und the Morane D 3800 produced under French licence from 1939 ended with two different models. The British ITT Bell R 10-A with four crystal controlled channels in the VHF band and the continuously tuneable shortwave station SFR 450. As the Swiss authorities preferred a station which was continuously tuneable, the placed an order of 189 sets at the Société Française Radio-Electrique in october 1939. Shortly after, it turned out, that SFR would not be able to fulfill this order. Over the Swiss branch of SFR located at Berne, a licence production has been organised rapidly with Swiss companies. Zellweger, Uster, got the contract to produce the transmitter, Autophon, Solothurn, the receiver, Elektromotorenbau Weber, Pieterlen the dynamotors and Gfeller AG at Bern the accessories. 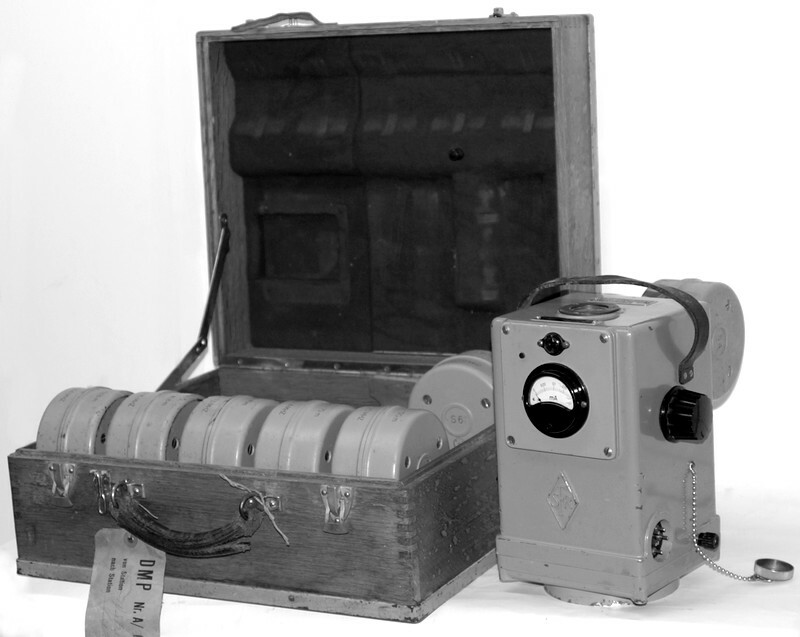 The early FG IX came with three mechanical frequency presets selected by Bowden cables, later the electro - mechanic tuning adaptor Autophon Telaccord (same as for the FG X) was used. Production progress was very slow, in january 1941, only 13 systems were ready to be fitted in the D 3800 Morane fighters. The wireless stations turned out to be unreliable and the frequency stability poor; an improved version was produced and until the end of 1943, only 28 fighters Morane D 3800 and another 28 Messerschmitt Bf 109 E could be equipped with the new set. Frequency stability continued to be a major problem. In 1949/50, all wireless stations FG IX have been removed definitely from the aircraft and subsequently saw liquidation at Dubendorf. The receiver is a superheterodyne covering 2000 - 12000 kHz ab, a 6C5 valve is used as oscillator, a 6L7 in the mixing stage, a 6K7 as IF amplifier, a 6Q7 for demodulation and first AF stage, a 6F6 in the AF output stage and a 6C5 in the beat frequency oscillator for CW reception. The transmitter has three stages and covers 2000 - 12000 kHz too. A 6L6 valve is used in the oscillator, another 6L6 as frequency doubler and a GOT 100 in the HF final stage. 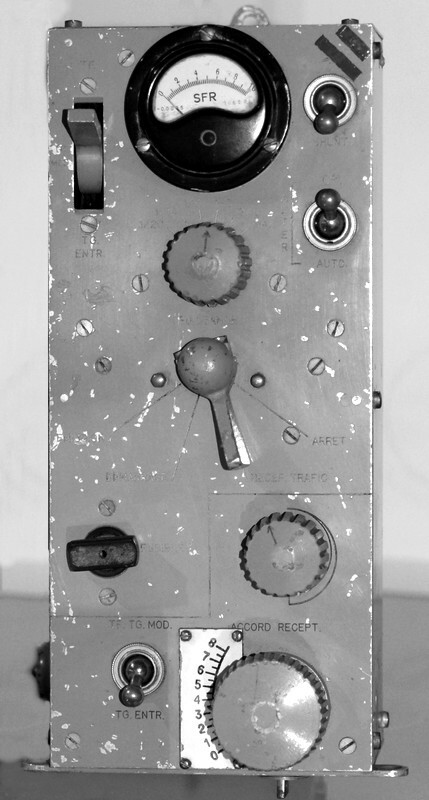 A 6J7 is used in the microphone amplifier, a 6F6 in the modulator stage and another 6F6 in the VOX (voice activated transmit mode) circuitry. 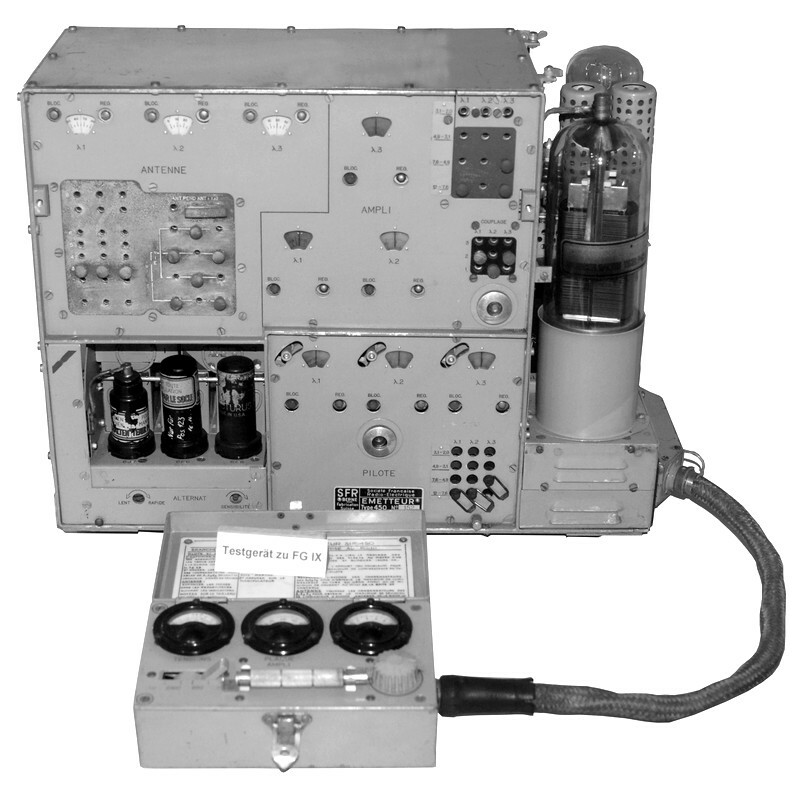 A control box is operated by the pilot to remotely control the wireless station, the pilot's hood with integrated headphones, the laryngophone and the morse key could be attached to the control box, which also features receiver fine tuning. Two independant dynamotors are used to generate the necessary voltages for the receiver and the transmitter. 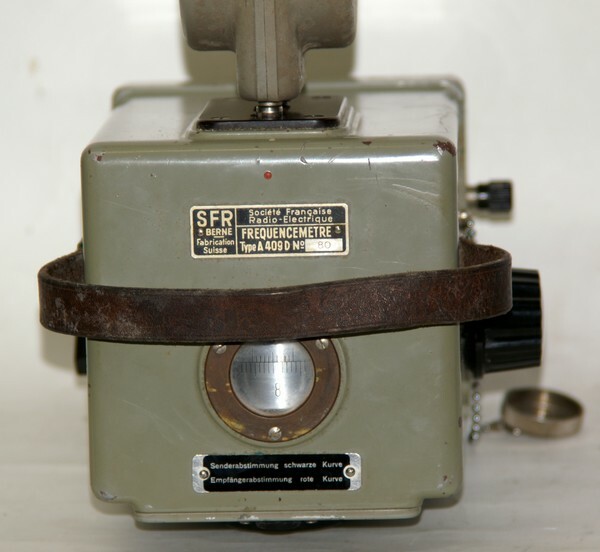 The three operation frequencies are pre-tuned by ground personnel before take off; for this, precision wavemeters SFR A 409 D have been used at the airfields.